I don’t know about you, but I buy my mirrors at IKEA. I don’t expect them to do anything more than help me figure out if my hair is sticking up or if my eyeliner has gone horribly awry. But as I age, the mirror has become more important. It helps me find sun spots, redness, or anything else I need to take note of for my dermatologist. So when I saw HiMirror Plus, a smart mirror that promises to find and analyze all of your skin issues and tell you if they’re something to be concerned about at CES this week, I knew I had to try it. The $259 Bluetooth and Wi-Fi-connected mirror has a camera and two LED light strips, one on each side. The camera takes a high-res image of your face, which the mirror then analyzes to give you percentages on dark circles, pores, red spots, dark spots, fine lines, wrinkles, and overall complexion. This mirror is not gonna tell you you’re the fairest of them all, that’s for damn sure. But it will give you skincare plans based on a combination of skin texture, firmness, brightness, clarity, and heathiness. It won’t diagnose medical issues, so if you have an irregular mole or a patch of rosacea, it won’t alert you to call a doctor. But it does point out issues you may have missed (or remind you that your crow’s feet are growing and you need to seek out the best night cream money can buy). 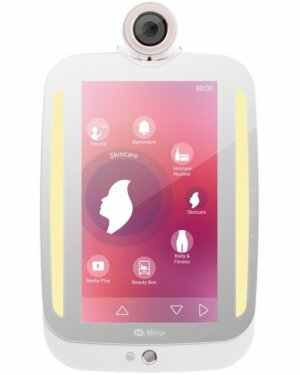 You can also use the mirror’s camera to scan a barcode on your skincare products to find out more information about them. The mirror stores months of photos (about 14,000 images, to be exact) so if you switch to a new skincare regimen, you can see the results over time. And because mirrors are usually in rooms where families congregate, like the bathroom or living room, HiMirror Plus can store up to six user profiles. The mirror is largely gesture-controlled, which is incredibly cool in person. After you take a selfie, simply wave your arm in front of the mirror, which turns into a display, to move through the menu and see each component of your skin analysis. This also keeps your mirror from turning into a mess of smudged fingerprints. Then there’s the ambient makeup lighting, which allows you to see what you look like in different settings: sunset, a restaurant, a mall, a harshly-lit office, and outdoors. You use a back button to tap through each light setting. I love this feature. You can buy cheaper makeup mirrors that do the same thing, but the combination of skin analyzer and light make HiMirror Plus more compelling. 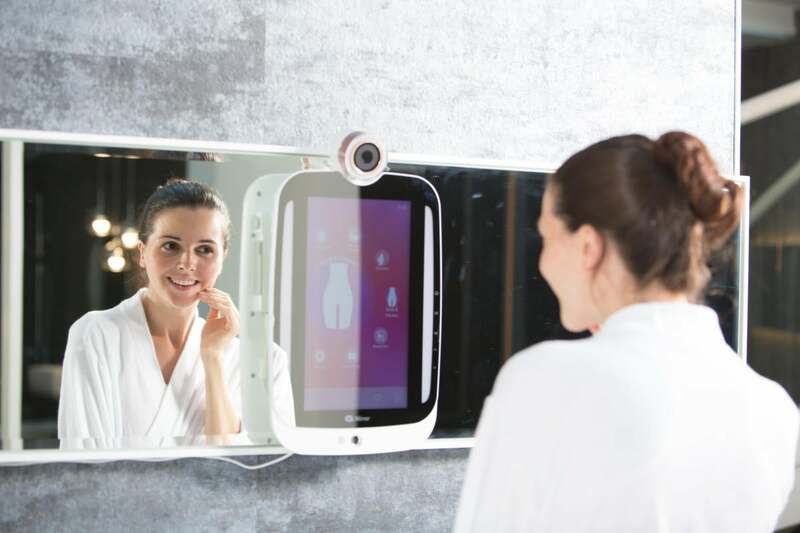 HiMirror also makes companion accessories, a hand-held skin analyzer called HiSkin and a smart body scale, that both sync to the mirror to take into account your skin hydration levels, weight, bone density, and more. The HiMirror Plus is available for pre-order now, and is scheduled to ship later in January.